Salvador Dali. Ascension. 1958. Oil on canvas. Jesus promised his disciples to send them his Father’s promised gift – the Holy Spirit. He led them to Bethany and blessed them with his hands raised. As he blessed them he parted from them, and was carried to heaven.
. . . through Jesus Christ our Lord, who lives and reigns with you and the Holy Spirit, one God for ever and ever. The Reverend Matthew Moretz offers a great explanation in contemporary terms of the Ascension on his YouTube channel, “Fr. Matthew Presents” “The Ascension and Mary Poppins: Father Matthew Presents”. Many families have stories that have been handed down from generation to generation. The stories capture and hold important lessons of life and faith. They tell us who we think our family is and what it means to us. Every congregation has a life story that reveals its personality and beliefs and its place in the community over time. For individuals, families, and the congregation, these stories are examples of how the good news of Jesus has traveled into and through their lives. May the one who goes from our sight prepare a place for all creation in the wideness of his grace and bring the powers of every quarter to worship at his wounded feet; and the blessing of God the Father, God the Son, and God the Holy Spirit remain with us today and always. Amen. Prayers for An Inclusive Church by Steven Shakespeare (2009: Church Publishing). 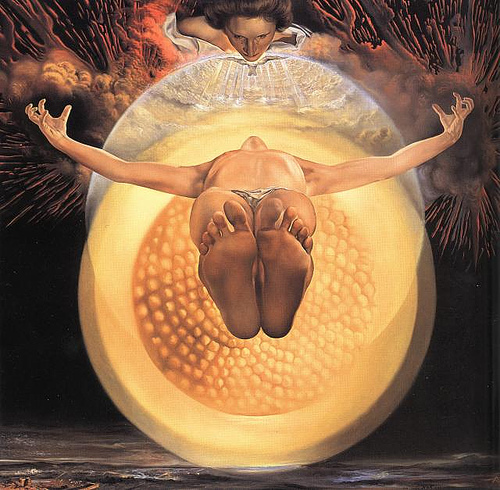 This entry was posted in Ascension, Education, Feast Days and tagged Apostles Creed, Jesus, Nicene Creed, Salvador Dalí. Bookmark the permalink.